I made a video about shaft alignment and the feedback I received prompted me to take a hard look at the issue. I learned from discussions and research that the concept of SST Puring was Approved by the USGA soley as a method of identifying the orientation of a shaft that would cause it to play as if it was round. There is a USGA rule that says a shaft should be round. During the time when the SST system was developed this was not always the case. It was discovered that if a shaft had significant radial stiffness anomalies, it could be oriented to created a tendency for the face to come to impact open, or in another orientation closed. This is contrary to the USGA’s rule. The process was approved to compensate for manufacturing tolerances of the time. Today, with most shafts essentially ’round’ to start with, shaft alignment brings nothing of benefit to the golfer. With the shafts we see today, the simple rule is if you have a shaft that needs alignment, it should be in a dumpster not in a golf club. Most of today’s premium shafts are functionally round, but not all. Even some of the ultra-premium shafts I have measured do not pass my simple quality check. There is a simple way to test a golf shaft. It requires a weighted laser pointer and a frequency device with a good clamp. Club makers know that a shaft can be rotated in a clamp to a position where it will oscillate on a flat line. Approximately 90 degrees from that point is another position where a second flat line oscillation can be found. These two spots represent the hard and soft planes of the shaft. A presentation of a study of several shafts can be seen at this Fit2Score article: “Radial Profiles of Driver Shafts“. The radial quality of a shaft can be determined by comparing the frequency of the strong and weak planes. If the numbers are the same, or within 1% of each other, the shaft is excellent. High quality tour grade shafts will have very little or no difference. Consumer grade shafts can have as much a 2% difference. The shaft in this illustration had a 3% difference. In my test equipment, 258 vs 266 CPM, a difference of 8 CPM. The difference between the strong plane and weak plane was a stiffness step in this model of shafts. Lets step back to the origin of using frequency to measure stiffness. It was created by Dr. Joe Braly and his son Kim Braly. The same Kim Braly whose initials appear on KBS shafts. In that system 10 cycles per minute, CPM, represented the stiffness difference between a Rifle 4.5 and a Rifle 5.5. In that system 10 CPM is a stiffness point. 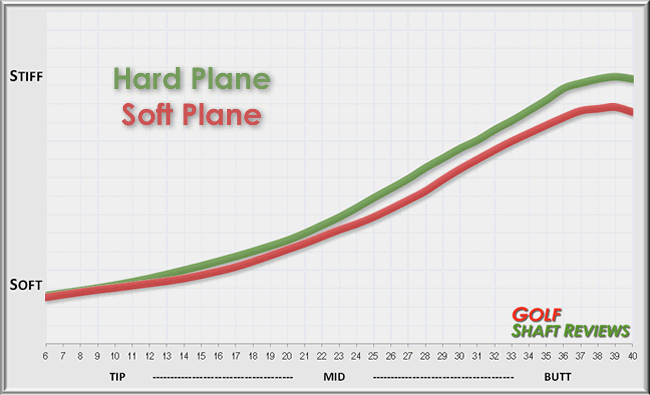 A shaft that is 266 CPM on the hard plane and 258 CPM on the soft plane is an R flex on one side and an S flex on the other. A 1% difference on that shaft is 2.6 CPM . That qualifies as tour quality. A 2% difference is 5.2 CPM. That is the limit of acceptable quality for a recreational golfer. Beyond that, the shaft is an R flex at the top of the backswing, an S flex at the horizon where the toe is up, and an R flex at impact where the toe is out. Or turn it around, S at the top, R at mid downswing and S again impact. That shaft belongs in dumpster, not in a golf club. This shaft is not usable in a driver with a rotating hosel tip. It cannot be re-orientated without causing a significant change of stiffness. It will perform differently at different orientations. Mark Maness, our DFW Iron Byron did some testing that gave some interesting results. I had two shafts that were identical in every respect, same make, model, weight, & flex. One had no difference in CPM from hard side to soft side. The other had an 8 cpm difference. During the test, neither of us knew which shaft was which. They were 70 gram S flex shafts. Mark was playing a 70 gram X flex of a similar design. The shafts were set in the standard position then turned 90 degrees, delofting the head 1.5 degrees. This put the soft plane then the hard plane toward the target line. This was repeated on the second shaft. The results were revealing in more ways than we expected. The image on the left is of the perfect shaft, on the right the shaft that had an 8 cpm difference between hard and soft planes. You can see the dispersion pattern of the perfect shaft was the same in both planes. On the shaft with the 8 cpm difference there was a significant difference in the two. On the hard side, the grouping was tighter, and on the soft side larger. It just so happened that the hard side was a better fit for Mark the unexpected finding of the test. Being properly fit for stiffness will decrease your shot dispersion. This test show how important radial quality is when drivers today all have rotating hosels. Unless you are playing with a quality shaft, rotation may have a greater influence on your shot patterns than simply changing loft. 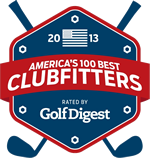 This entry was posted in Golf Shaft Technology, Russ Ryden - Fit2Score on April 22, 2014 by Russ.